Today, we will be introducing a pachislot machine of “Lollipop Chainsaw”, a highly popular horror action video game not only in Japan but also at overseas. “Lollipop Chainsaw” is about a beautiful cheerleader who fights against zombies with a chainsaw, and its concept is followed in this new pachislot machine as well. Player gets to enjoy exhilaration of winning and cutting zombies in half. It is expected to make its debut at end of this year. Give it a shot. 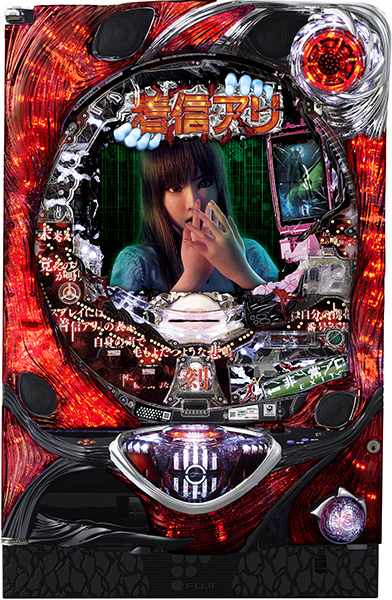 Today, we will be introducing a pachislot machine of “Hell Girl”, which its pachinko version is already running popularly!! 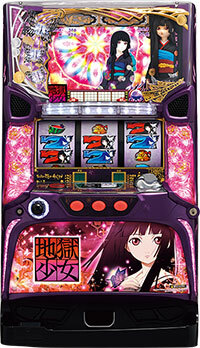 This machine is loaded with a function to choose the music and customize the costumes of Ai Enma, the heroine. Player gets to enjoy the machine depending on his/her own tastes and mood. By meeting a certain criteria, selections of music and costumes increase that more you play, the more enjoyment you get out of it!! Also, the second hell girl of Yuzuki Mikage from the third series of “Mitsuganae” makes her appearance, just like the pachinko version. 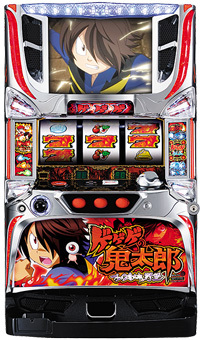 This machine, filled with other various characters as well, will make its debut on 19th of October!! Today, we will be introducing a pachinko machine of “One Missed Call”, a masterpiece of Japanese horror that even became a social phenomenon. This film was also remade in Hollywood, and cell phone is an important item. A cell phone receives a death notice from the future, and whoever gets that notice ends up exactly as what the notice says. Accessories such as cursed mouth, a broken cell phone and other devices/traps gives shivers to a player. It will make its debut on September 7th.Don’t miss it!! 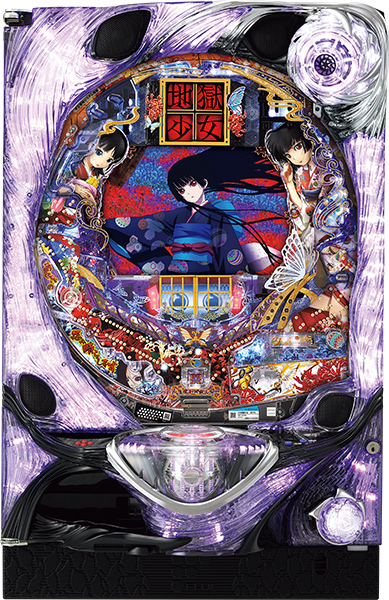 A pachinko machine we will be introducing this time is the sequel of “Hell Girl”, which the previous machine was quite popular. Although it is originally a horror anime, you should pay extra attention to the beautiful female characters. In addition to the heroine from the previous machine, Ai Enma, you will get to see the next hell girl, Yuzuki Mikage. Figurine of Ai Enma and Yuzuki Mikage wearing kimono is set on the machine for beautiful decorations. Also, this machine is loaded with songs sang by characters.There are songs you can only listen to with this pachinko machine!! Date of debut is set on this coming May. Let’s leave our fate in the hands of two beautiful girls!! 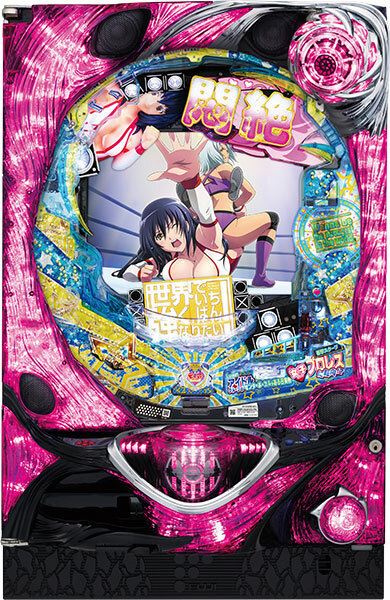 Today we will talk about a pachinko machine based on the hit manga/anime classroom comedy series Hell Teacher Nūbē! This series is taking off again this year with the sequel manga Hell Teacher Nūbē NEO being released after 15 years, and the live-action drama starting this past October. 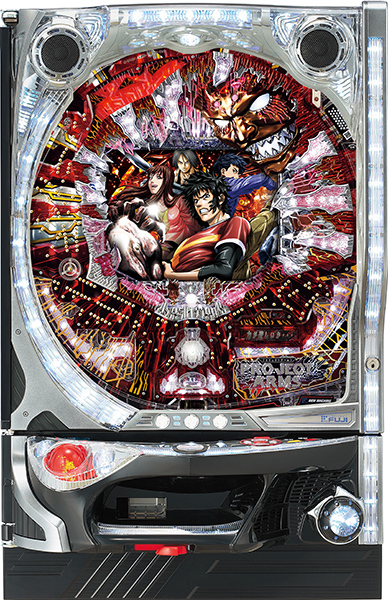 This machine features a large accessory modeled after Nūbē’s representative power “Oni no Te,” and many other things that bring out the excitement of the original work! Naturally, it also features the famous anime opening theme Baribari Saikyou No. 1! Protect the students from the evil powers with Oni no Te and Nūbē! 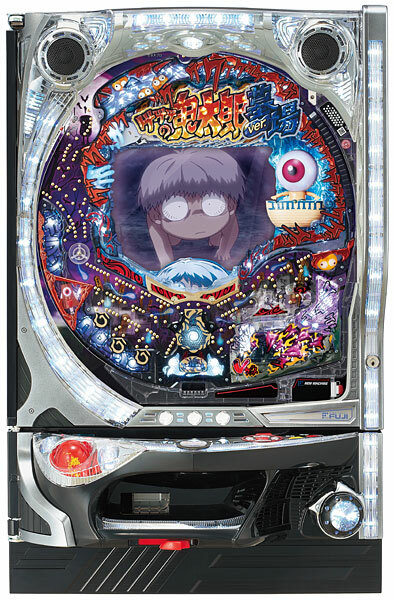 Today we will talk about the pachinko version of the pachislot machine we talked about on Tuesday: “The Ring”. This is the 3rd release in the series and Sadako has become even scarier, and is sure to make the player scream. 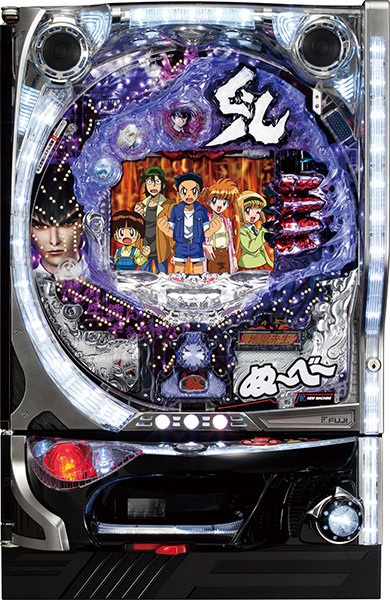 These “scary but fun” horror pachinko series are perfect for hot summer days. With the pachislot version being released at the same time, the parlors are sure to have Sadako lurking around every corner. Be sure to play your fill of this Japanese horror game. 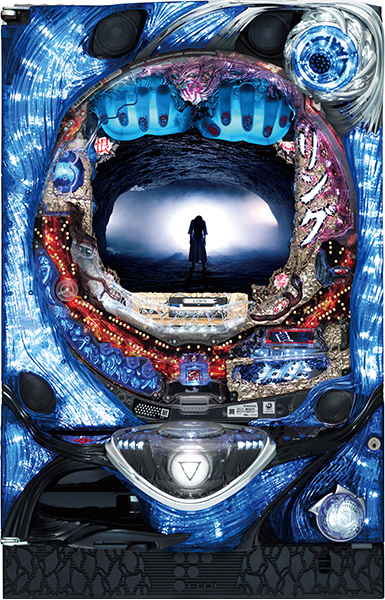 At last, the acclaimed pachinko horror series by Fuji is coming to pachislot! The quintessential Japanese horror movie “The Ring” will be made into pachislot! 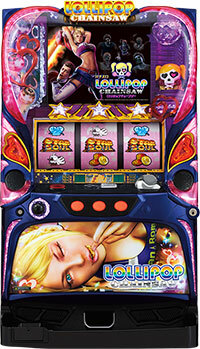 It features an easy to understand jackpot system that comes from the characters becoming cursed! There are also accessories that will make you jump out of your seat with fright! 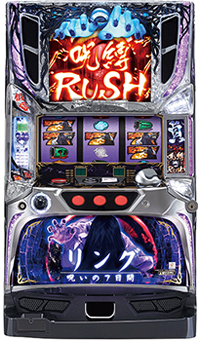 The release is set for the latter half of July, along with The Ring 3 for pachinko. 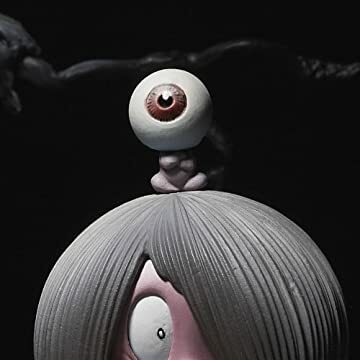 The intensely scary story of Kitaro is coming to Pachinko. Don’t miss out on the fear of stepping into a graveyard and being sucked into hell!! Do you know about the Japanese ‘yokai’ monster, which existed in ancient Japanese folklore? 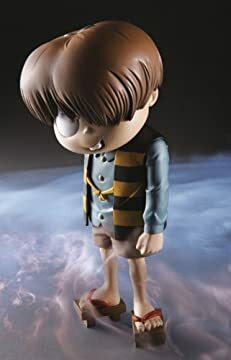 Kitaro, the child of a ghost, uses a special weapon that only he possesses to put an end to many mysterious situations involving yokai. The battle with the yokai begins in February, 2014. ARMS is a weapon made of thousands of nanomachines and silicon that has the ability to merge with a biological being. The heroic battle shall begin between the secret organization “Egrigori,” whose background is in a huge World War II era military-industrial complex, and “The chosen four” who have fused with ARMS. Packinko CR PROJECT ARMS will be released in December 2013.